Salamanca is a province that offers a great variety of open-air activities, which are either free or very cheap to enjoy. The beautiful natural surroundings of the town, lying on the banks the river Tormes and surrounded by mountains, makes it a paradise for people who like trekking, rock climbing, and for nature lovers in general. Salamanca also has a lot of nice parks and gardens where people can relax in the open air. To mention a few there are the San Francisco Park located within the town walls near the Monterreys garden, Alamedilla Park from 1882 located along the train lines and the Jesuits Park with its more than 100,000 square meters located just outside the old town. For people interested in doing a nice bargain there is the street/ flea market 'Mercadillo de Salamanca' located on the street Rector Esperabe in the Southern part of Salamanca near the river. 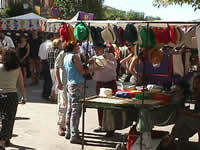 This major street market is open every Sunday from 9.00-15.00. There you can buy everything from clothes and shoes, to paintings, old furniture or electronics and it is also a popular area to have lunch on Sundays.